Ron Gilbert, best known as the creator of Monkey Island and Maniac Mansion, just launched a Kickstarter for a brand new old-school point-and-click adventure game that looks just about incredible. 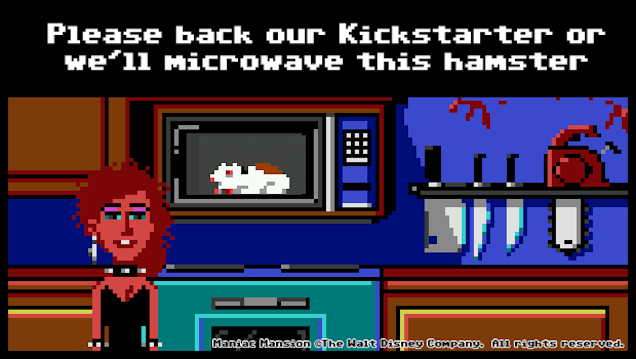 Yes, yes, we're all suffering from Kickstarter malaise, and these days crowdfunded projects seem ripe for disappointment, but this is pretty much a dream game for anyone who played PC games in the 80s and 90s, back when many of us fell in love with the likes of Maniac Mansion, Indiana Jones and the Fate of Atlantis, and Zak McKracken. This is Thimbleweed Park. Gilbert and co-conspirator Gary Winnick want $375,000 to make it happen. And it sounds wonderful. "We want Thimbleweed Park to be like an undiscovered classic LucasArts' adventure game you'd never played before," they write. "A game discovered in a dusty old desk that puts a smile on your face and sends a wave of nostalgia through you in the same way it does for us."